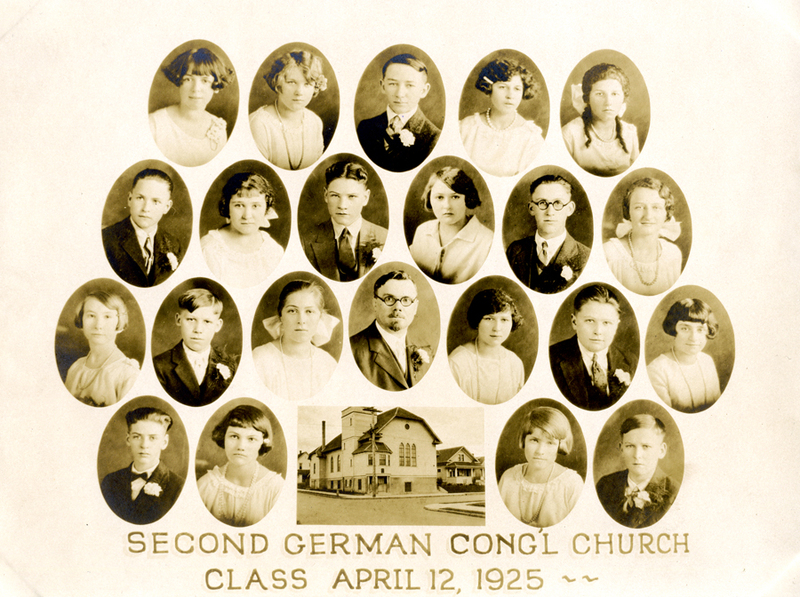 The Second German Congregational Church Confirmation Class of April 5, 1925. Top row from left to right: Rachel Bihn, ?, David Kell (1) (3), ?, ? Third row from left to right: ?, ?, ?, Rev. Heinrich Hagelganz, ?, Heinrich Geis, ? Bottom row from left to right: Fred Schafer (possible), ?, ?, ? Not identified: Emily Funk, David Hilderman, Amalia Knaus, Henry Kniss, Leah Koch, Heinrich Krieger, Eva Nuss, Esther Reiber, John Reusbich, Fred Schafer, Lydia Schreiner, Anna Spreier, Martha Van Dillon, Maria Vogel, Emilie Wolf. (1) Allison Wysocki identified David Kell and provides the following information: "The Kells were German and came from the Volga village of Holstein. The name was originally "Koelln" and then became "Kelln" and was eventually shortened to Kell at some point." (2) Sandra Ramirez identified Anna Schneider, the daughter of Heinrick and Maria Schneider. (3) Tracy Lynn Phipps identified her grandfather, David Kell. David Kell married Amalia (Molly) Miller who was a member of the 1926 Second German Congregational Church Confirmation Class. (4) Harold Koehler identified his mother, Hulda Leonhardt.